I come from a family of musicians. My older brothers are in multiple bands and my parents wrote their own songs. My dad, especially, prided himself in writing theological verses and tunes. In fact, he usually carried a religious verse or two in his pocket ready to sing at a moment’s notice. Just in case inspiration hit and then he would burst out into song. He believed life is a Broadway show (or a Bollywood movie which is probably more accurate). Sometimes he would burst out into song even if he was nervous or inspiration didn’t hit – because he felt that was a great way to make friends. He figured he could lure them in with his songs and my mom’s samosas. 9 out of 10 times it worked. The times that it didn’t work he would blame my mom’s samosas. He also had a competitive streak. Part of the reason he kept a verse or two in his pocket was in case someone else tried to use that luring strategy at a dinner party. He wasn’t prepared to let anyone outdo him. In particular, there is one such event that still makes me laugh. I was visiting home from college for the holidays. My parents had already signed me up for various social events. This is a good place to elaborate I don’t just come from a musical family but from a family of musical social butterflies. We lived in Cyprus at the time and my parents insisted that on a small island it is even more important to be “seen” at all events. On one such occasion my dad particularly outdid himself. He put on his very Bill Cosbyesque sweater knitted by my mom, of course, so he could brag about it and wore his brand newly, starched, maroon turban for the holidays. In his pocket were carefully placed verses of a few songs he wrote. Equipped with a tupperware of my mom’s finest samosas, off we went to the holiday soiree of the year. I don’t remember what I was wearing. It was classy but I made sure I didn’t steal my parent’s thunder. After all this was their night and I loved how excited they got. The evening started like any other. Fashionably late grand entrance expecting people to be excited about my dad’s sweater. Only no one paid attention this time. 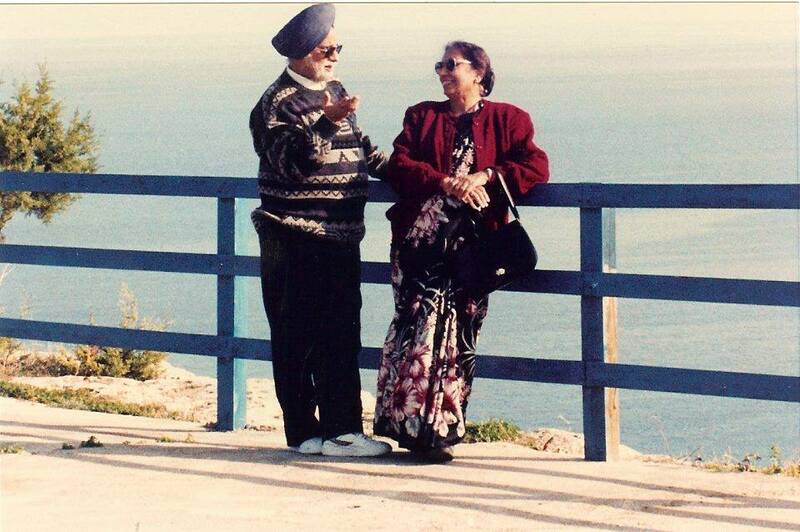 Determined to find out what was distracting all the Indians in Cyprus, he walked over to where everyone was gathered. To his delight, the Greek President’s Indian wife had decided to attend tonight’s social soiree. Jackpot! So what did my dad do? Never to shy away from a challenge, he burst out into song. Pulled out the verses from his pocket and started singing. Just like a Bollywood movie. The crowds parted and everyone listened. And when he was done, my mom distributed samosas. Like magic, Mrs. Clerides walked over and spent the entire evening speaking to my parents. As you’ve already guessed how this story ends, my parents became best friends with Mr. and Mrs. Clerides. I don’t think I ever fully got used to seeing the Greek President randomly at my parents house but my dad made it seem like a no brainer. This is one of my favorite things about my dad. He would set an intention and make it happen. Whether it was to make new friends, be everyone’s favorite social butterfly or brag about my mom’s knitting. Even when he was nervous he took risks. All the while dressed to the nines, distributing food and with music verses in his pocket ready to perform at a moment’s notice. After clicking on subscribe, please go to your email and click on the link provided to complete your subscription. Happy Reading!